One look and it’s easy to imagine how farmers’ markets nurture communities—piles of lush, colorful bounty and smiling people milling about. But behind the sights, sounds and scents are well-crafted success stories. 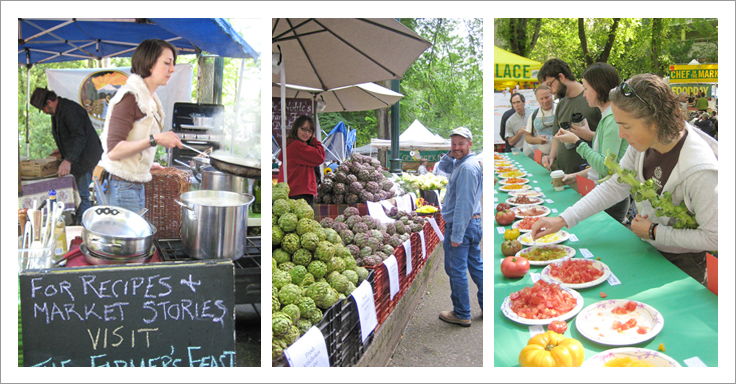 Like many markets, Portland Farmers Market (PFM) has a mission to sustain local growers and food producers, strengthen the local food economy and create community gathering places. There are also peripheral, sometimes overlooked, side benefits that inspire, delight and sustain us all. Every dollar spent at a farmer’s market guarantees the continued existence of farms. The loss of these farms would mean a risk of overdevelopment; the reduction of healthy food options, jobs and local dollars; and an increase in reliance on fossil fuels used to ship food long distances. It is suggested that ninety cents of every dollar spent on locally grown food remains in the local economy as opposed to twenty-five cents if spent on food that is shipped in. In an inspiring reversal of a century-old trend, there has been a rise in new farms—many small and many women-owned—as consciousness rises about the need for more meaningful connection to the sources of our food. Farmers’ markets can be agents of change beyond creating thriving local food systems. PFM’s strategic plan includes a number of sustainability efforts—one being a 3-year waste-reduction program named Evergreen. PFM exceeded their first-year goal of a 50-percent diversion rate (from landfill to recycling/composting). With this robust program, PFM calculated waste, set attainable targets, created stations and signage, as well as education resources for vendors and shoppers. Without doubt, these efforts require pooling knowledge and resources. PFM collaborated with many entities—too numerous to list. It may take a village to raise a child, but it takes a great staff to use the village to create a vigorous commons. They took advantage of a Mayor’s grant to fund the planning and execution of the Evergreen program and sought the expertise of an event greening company to help them measure and predict waste. 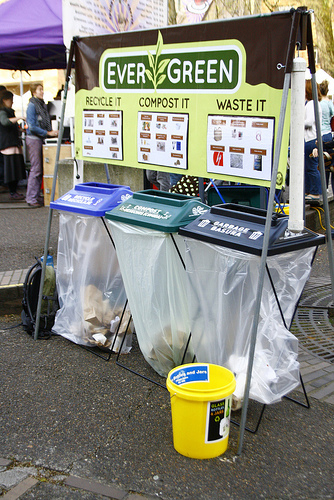 Adapting an existing model of a farmer’s market recycling station from another organization allowed them to put their energy into tailoring features specific to their needs and our local community. It is said that shopping at a farmer’s market creates ten times the interactions than at a typical grocery store. These connections that develop among and between shoppers and vendors satisfy a craving that people have to connect in more authentic ways than today’s world often allows. Musicians entertain, chefs inspire, farmers teach. Portland Farmers Market has created programs that range from greater access for low-income individuals to buy market produce, a market-friendly bike station, recipe station, and kids cooking events, to name a few. And many food purveyors like picklers, chocolatiers, popsicliers and bakers have had their start at the market. Over the years, 50 such vendors then blossomed into bricks-and-mortar businesses. There is a ongoing effort to nourish these budding foodpreneurs. Pictured above (L to R): Kathryn LaSusa Yeomans from The Farmers Feast cooking up mushrooms, Patreece DeNoble with her artichokes, and a market shopper sampling from 30-plus tomatoes at the Tomato Fiesta event. Evergreen booth: photo by Allison Jones. Do you have a farmer’s market near you? What do you get out of visiting your market, aside from the food you take home? Has it changed the way you eat? Great post. I really like the depth that you shared around this particular market – esp. their goals and the time frames. I have been searching for the actual research that supports “It is said that shopping at a farmer’s market creates ten times the interactions than at a typical grocery store” so if you have a source, I’d be very interested. I hear this quite often and would love to learn more. Hi Tammy. Thanks for reading! I just heard that stat again the other day on public radio on this show with Bill McKibben about climate change. http://speakingoffaith.publicradio.org/programs/2010/moral-math/. He said that parapsychologists have studied the interactions that people have in the two environments. Wendell Berry has quoted this stat as well. If I can find an actual study, I will let you know. This organization might be a good place to confirm the study: http://farmersmarketcoalition.org/.